Solveig Muus is principal of Silk Road Asian Sourcing, a product sourcing firm that helps U.S. companies create and produce new product in the Far East. Silk Road assists clients in defining their merchandise needs, developing their product specs, and finding the ideal factory in Asia to produce those products at the best possible quality and price. Additional services include sample development, merchandise inspection, shipment consolidation, and expert, detailed and timely correspondence between client and factory throughout the process. Solveig has spent more than twenty-five years traveling, negotiating and communicating with major manufacturers in China, Hong Kong, Taiwan, the Philippines, Thailand, Vietnam, Korea and India. Her product specialties cover a broad range of materials from wood, brass, and glass to resin and porcelain, textile, jewelry, plastic, candles, and many others. Solveig Muus has an MBA degree from Metropolitan State University (St. Paul, MN) and is a graduate of St. Olaf College (Northfield, MN), where she earned a bachelor’s degree in English and Fine Arts. Solveig resides in Phoenix, Arizona. 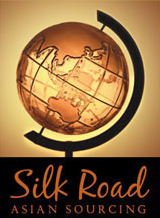 What is the "Silk Road"? The Silk Road was the great transcontinental route linking the Roman Empire in the West with the imperial court of China in the East. It was the information super highway of its age, serving as the conduit not only for goods but also for the transmission of knowledge and ideas between East and West. First traveled by Zhang Qian when he was sent on a diplomatic mission to the Western Regions in the Han dynasty (206 BC-AD 220), the road was officially named in the mid-19th century by the German scholar, Baron Ferdinand von Richthofen. The ancient route started at Luoyang and the magnificent Chang’an (the ancient name of Xi'an), the capitals of the Tang Dynasty. It reached the Yellow River at Lanzhou in the Gansu Province, then skirted westward along deserts and mountains before dividing into three routes at the oasis of Dunhuang, which is one of the well-known Chinese historical and cultural cities, and the bright pearl on the ancient Silk Road. Walking through Xinjiang, brave ancient merchants and travelers headed in a continuous journey westward until they arrived in Rome. Through our countless sourcing trips throughout the Far East, Silk Road Asian Sourcing has strong factory relationships in more than a dozen countries, especially in China and in the burgeoning manufacturing market of India. We specialize in gift and home décor items of all shapes and sizes, furniture, housewares, garden items, Christmas decorations, soft goods, and much more. We will connect you with factories that produce products in wood, glass, acrylic, polyresin, porcelain, brass, jewelry, novelties, textiles, leather, plastic, wax, toys, books and paper products, painted tin, iron, pewter, epoxy, and so many others, it’s impossible to name them all here. Ask us! If we can’t help you, we’ll find someone who can! Product Development and Factory Sourcing is Silk Road’s raison d'etre, our reason for being. We believe in our ability to find exactly what it is you are seeking in quality, price, delivery, service and value. We promise to listen to you. We promise to work hard, and efficiently. And we promise to have fun along the way, so that your experience will be a pleasant and a memorable one.